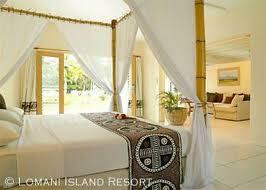 Lomani Island Resort, Fiji 5.0 out of 5 based on ratings. 1 user reviews. Lomani is on Viti Levu is in the Mamanuca group of Islands. The Mamanuca Islands are famous for their white sand beaches, abundant sea life and glorious sunshine. “Lomani” is the Fijian word for love. This resort has abundant activities including golf nearby, fishing, kayaking, swimming pool, and features some awesome scuba diving adventures among its other resort and island activities. There are towering coconut trees, abundant scented flowers, and all the amenities of a great tropical vacation.